Canterbury is a city located in South East England in Kent county. The city’s cathedral was and still is one of the most important pilgrimage sites in the UK due to its strong influence in Medieval Times. Canterbury is also the starting point of the Via Francigena also called the Camino to Rome as it was here Sigeric the Serious, Archbishop of Canterbury, started his pilgrimage all the way down to the Vatican to be blessed by the Pope. Canterbury was actually the centre of Christianity in Kent after Saint Augustine was sent by Pope Gregory the Great to convert King Ethelbert. Saint Augustine requested the building of spectacular monuments such as the Cathedral and Saint Augustine Abbey, to turn Canterbury into a place of pilgrimage. Canterbury became an essential site to visit when Thomas Bucket, Archbishop of Canterbury from 1162 to 1170, was murdered by followers of the King of England, Henry II in Canterbury Cathedral. After that pilgrims visiting the shrine of Saint Thomas reported it to be a place of miraculous healing. Although, nowadays the shrine no longer exist, as King Henry VIII ordered it to be destroyed and despoiled during his reign. Today a candle burns at the site of the former shrine. Even before Saint Augustine had arrived, a sense of Christianity had started to develop in Canterbury with the Church of St Martin built in the 6th century for Queen Bertha, wife of King Ethelbert. Saint Martin’s Church is also the oldest church in the English-speaking world still in use. Indeed, Canterbury has a very rich history and heritage, for instance from the Normal era we can visit Canterbury Castle, the only one of the three Royal Castles in Kent remaining; from the Roman Period, visitors can admire the Roman Museum and mosaic pavement dating from around 300 CE. By wandering the streets of Canterbury you will definitely notice all different periods and influences that the city went through thanks to the different landmarks such as Beaney House of Art & Knowledge, Westgate Gardens or Davison’s Mill. 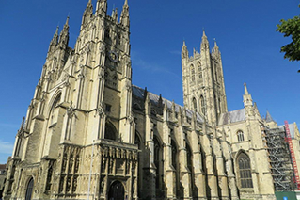 Starting the Via Francigena in Canterbury Cathedral will allow you to retrace the first steps of Sigeric’s pilgrimage and admire the region’s heritage buildings, witness to its rich history. For more information about the Via Francigena, the Camino to Rome, starting in Canterbury, contact our travel specialists.